Hitachi is speeding up demonstration experiments that are aimed at building a smart grid in Hawaii, Nikkei Asian Review reports. It’s just one of numerous developments in the Aloha State’s energy sector. 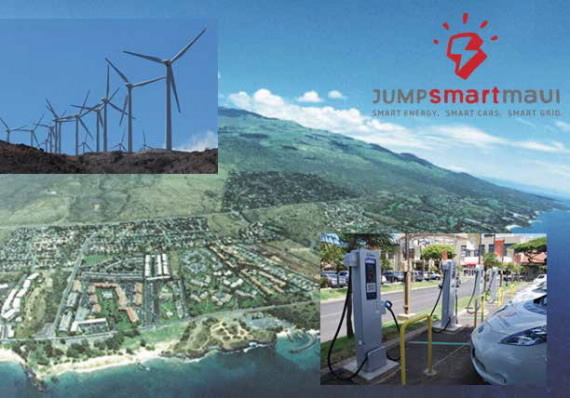 JUMPSmartMaui is a demonstration project to develop advanced smart grid system utilizing renewable energy resources and electric vehicles (EVs). Hawaii depends on oil to generate 70% of its power, while residents and businesses are saddled with electrical bills that are 2.7 times the U.S. average, the story notes. The state hopes to obtain all of its electricity from renewable sources by 2045. In June 2015, Governor David Ige signed into law four bills that are expected to advance Hawaii’s position as a leader in renewable energy. Among other recent developments, solar + storage firm Sunverge Energy has unveiled inverters developed for Hawaii Electric Companies’) strict technical specifications for solar installations. Sunverge’s Solar Integration System (SIS) will allow Hawaiian residential and commercial customers to gain reliable renewable energy while earning maximum savings under HECO’s proposed new Time-of-Use rates. Sunverge raised $37 million in February from investors including Siemens and Total, and is raising project equity finance for new global projects, the company told CleanTechIQ last fall. Meanwhile, residential solar developer SunRun installed its first Brightbox, an energy storage system for homeowners, in Hawaii last week, the first ever solar-and-storage system to be installed under Hawaii Electric’s new Customer Self-Supply program, it says. Hawaii is also presenting opportunities for EnSync, a developer of energy management systems, which has completed power-purchase agreements with commercial building owners for systems that combine its energy storage and power management systems with solar panels. EnSync, formerly ZBB Energy, is currently developing its first Hawaiian project, a 20-year deal worth about $3 million to provide solar plus storage to the University of the Nations on the island of Hawaii, according to the Journal Sentinel.